Source: Purchased. This is my honest opinion. It's been days now and I still have no idea what to write. I'm sorry, ok? But this is the point where I give you some sort of garble as to what I think I think of it. Reader beware. This is your one and only warning. The truth is that I am disappointed in this book. I expected quite a bit more than what I got because THE HYPE. It's ridiculous. So I did something I never do and bought the book the day it was released. And read it not long after I got it. However, unfortunately I had some problems with it. Perhaps the biggest one was that I felt the pacing of the book was way, way too slow. I can't deal with slow pacing in books. I get disconnected and bored. 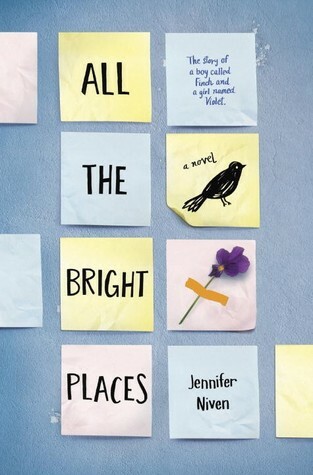 As I did with All the Bright Places. I think a lot of stuff to do with the homework project Violet and Finch did maybe could have been cut. The other thing was that while I loved Finch right away, I didn't really connect with Violet from the start. Although, as her relationship with Finch blossomed, I found myself becoming more accustomed to her. I liked the way she kind of grew as a person and the way this was done gradually. Which of course the slow pacing allowed to happen. Ok, so it's good for something. While I wasn't as emotionally invested as others, as I was a little detached from the story, there were a couple of those moments where you can just feel your stomach drop. Out of your feet. While I didn't cry at all during the book I still had this very sick feeling that something was going to happen. Which I won't share of course. All in all, I felt like the issues dealt with in the book were handled with expertise. The characters were so realistic and the author has done a fantastic job with her book. I really would recommend this book. I think all teens should read it - while in countries like Australia the cheerleader/jock/band geek kind of stereotyping isn't as prevalent as it is in America, stereotyping still exists and really can wreck a person's life. Even days and days later the story has stuck with me and I expect it to stick with me for a long time yet. And of course I'm looking forward to the movie.